Try it free for 30 days! Click here to order now! Guaranteed or you don’t pay! Studies show that adding hypnosis can help you lose more weight and the benefits increase substantially over time! Hypnosis has been approved for medical and psychological purposes for 50 years. 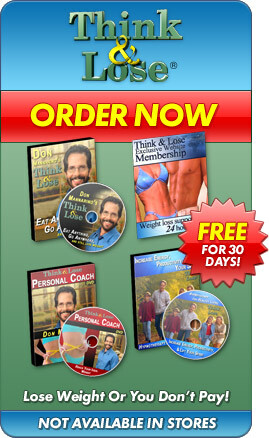 Your ‘Think and Lose®’ weight loss program is FREE to try for 30 days. If you keep the program after your 30 day trial, your credit card will be charged a one-time payment of only $39.95 plus $12.95 shipping and processing. Therefore, your credit card will not be billed for the ‘Think and Lose®’ program until 30 days after you receive it. If you’re not completely satisfied, for any reason, just return it and you will not be billed for the program or any shipping and processing charges, so you have absolutely nothing to lose – except weight. If you don’t lose the weight, then YOU DON’T PAY A PENNY! All orders shipped by USPS. Additional Shipping Charges: AK, HI, PR, GU will be sent by Priority Mail and there will be an additional $4 surcharge. Canadian customers will receive their orders by USPS International Air and will require an additional $7 surcharge per order. Don Mannarino offers you clinical hypnotherapy coaching to help you reach your ideal weight quickly. A self-hypnosis CD program for healthy dieting and natural weight loss.